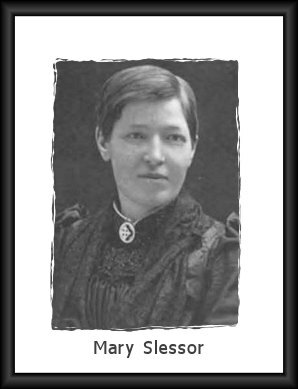 Mary Slessor (1848-1915) was a Scottish missionary who served the Lord Jesus Christ in Africa where she was commonly called "Ma" Slessor. Mary Slessor: Mission Africa. Short biography. Mary Slessor. From her birth to age 28, when she went to Africa. Mary Slessor, the White Queen. Her life during 1913-14. Mary Slessor, 1848-1915. Short biography. Mary Slessor. Chronology of her life. Some Thoughts Written in Mary Slessor's Bible. Mary Slessor, the "White Mother" of Darkest Africa. Short biography. Mary Slessor of Calabar. Short biography. Mary Slessor, Among the Cannibals of Calabar. Short biography. Mary Slessor, Heroine of Calabar. Biography for young people. Mary Slessor. Biography for children. Mary Slessor: Forward Into Calabar by Janet & Geoff Benge. Seattle, WA: YWAM Publishing, ©1999. Age 10 and up. Mary Slessor: Missionary Mother by Terri B. Kelly. Greenville, SC: JourneyForth, ©2014. Ages 9-12.